AP Racing required a new type of Dynamometer which could match the high speed and acceleration rates achieved by Formula 1 cars. Also of importance was a design which could carry out these tests within the actual sections of car’s standard wheel and suspension assembly, mimicking the airflow through ducting and around the brake. For over 30 years AP Racing has been a World Leader in the Technology and Manufacture of Brake Calipers and race clutches. It could test the brake and caliper both on a rig mounting AND in within the actual wheel and suspension assembly. It had the power to simulate Formula 1 speeds and acceleration rates accurately. It could simulate the air flow around the caliper and allow for investigation into the airflows through different ducting designs. Track data could be imported on the braking profiles and acceleration profiles. Because of AP Racings’ strong design capabilities it was decided that the rig would be built in-house which would provide cost benefits and absolute control on the system capabilities. For the software and electronics control system Computer Controlled Solutions were selected based on their experience in this field and the number of successful test machines previously provided and maintained for AP Racing. Computer Controlled Solutions was formed in 1994 and has produced many complex test, control and acquisition systems for industry. An alliance member of National Instruments since 1994 with two certified LabView developers, predominantly providing advanced LabView solutions based around National Instruments hardware. 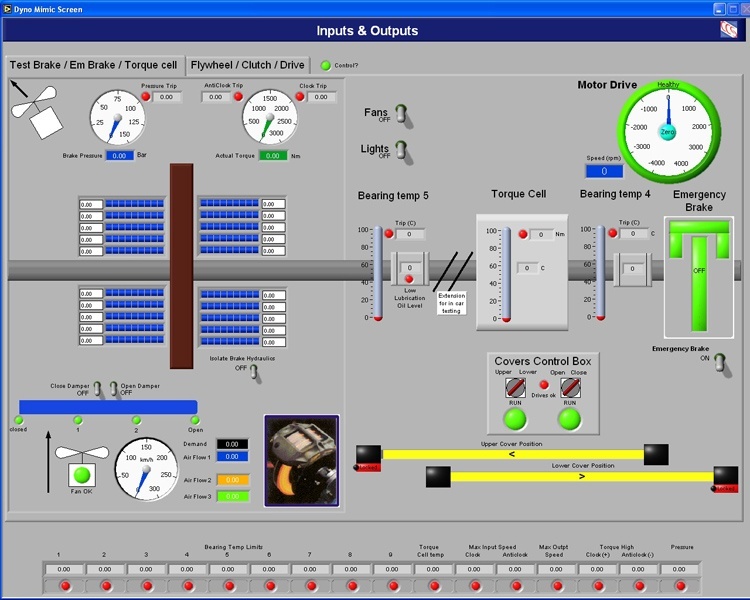 The software was written completely within LabView. 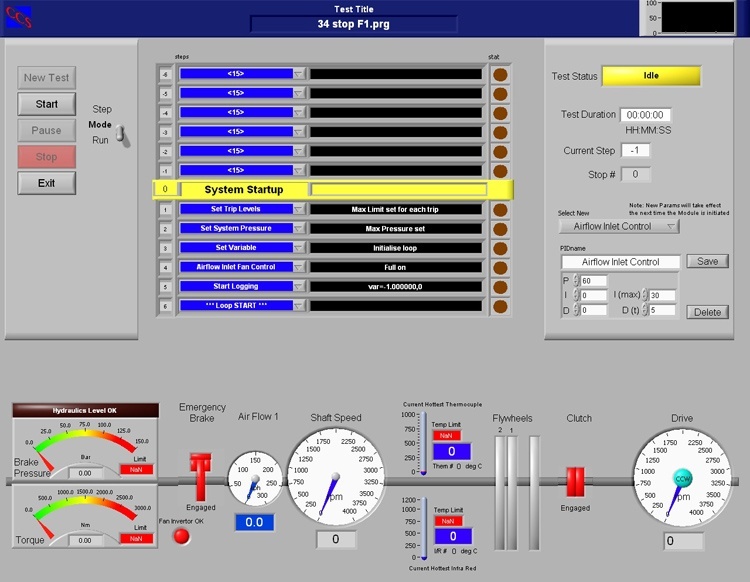 Intuitive: centred around the main menu as shown in figure 1 this screen allows the operator to check all I/O, build tests, run tests and analyse data. A simplified menu option also changes this screen to a basic run screen for running pre-designed tests. Calibration Screen: Making good use of dual TFT displays the calibration screen was designed to provide tabular view of all I/O on the left screen. These tables are best for the calibration engineer to view and check I/O. On the right screen was a complete mimic of the rig which is useful in identification of transducer and controller location upon the rig (see figures 2 & 3). Modular, Simple Test Development: We broke down all aspects of a test into simple modules ie: Apply brake, Goto Speed, Loop, Start/Stop Acquisition. The user could then build up a whole suite of tests by putting the modules together in a simple list. 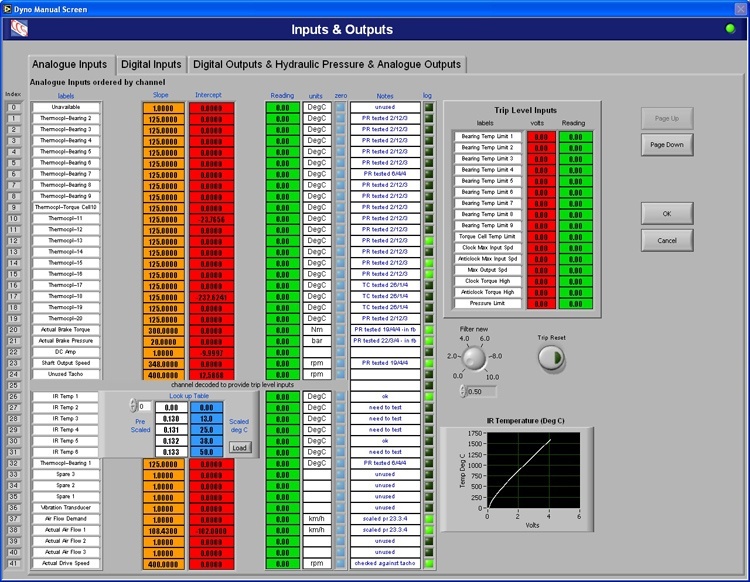 Intuitive Run Screen: Taking advantage of the speed of LabView we could present a full run screen indicating position in the test, mimic, dual scrolling graph displays and all status information (see figure 4). The upgrade of LabView versions went smoothly – CCS had assisted in Beta testing this product prior to release which gave us initial confidence and found the new release to be stable and straightforward to upgrade to. Faster Data Acquisition – The system was designed to control, continuous save to disk and display mimics and graphs on dual screens at data rates upto 2kHz per channel. By implementing the DAQmx code we saw an approximate 5 times increase in acquisition rates, which we took advantage of to free up the system for more complex real time control and displays. Non Linear Acquisition – Using DAQmx allowed us to apply a non-linear fit to Infra-Red temperature transducers automatically, thus avoiding post processing and allowing real time display of these linearised channels. Sub Panel implementation – The newly implemented sub panels could be used. These allowed us to show the status of a particular point in the test in a sub panel on the main run screen. One advantage here was that the main panel kept the focus which kept the Abort button active while sub panel actions were carried out. Speed control – control of the motor inverter. It was completely controlled within the LabView environment. This is important from a software maintenance view as it avoids having other software products and associated libraries which can create version control problems and extra complications in re-installing software. Low cost. In comparison with other DSP implementations or servo controllers, for 4 channels the price-performance could not be matched. High PID loop rate. PID loop rates of upto 16kHz ensures that the PID control is a few orders of magnitude better control than some common servo controllers thus providing very smooth mechanical movement and control. Note: Since implementation the NI FPGA cards have been introduced which would also have been ideal for this application. The system is now running successfully, testing all ranges of motorsport brakes and calipers both for AP Racing development and Formula 1 teams. Completion of this project has resulted in a unique and advanced method of brake testing. It’s ability to carry out full dynamometer brake testing within a section of the car has allowed an unparalleled source of data to be acquired and analysed thus feeding back accurate data to assist in optimum brake design. Using LabView and associated hardware has resulted in a stable system achieving complex control and maintaining ease of use for the operator. We are also looking into implementation of a vision system which will provide a data embedded video file. Paul Riley is the MD and software engineer of Computer Controlled Solutions Limited who have been alliance members with National Instruments since 1994. He has an extensive physics/electronics/computing background applied to test and production machine control and data acquisition.